Do you like it? I’m really excited because I broke out the glitter – and it’s not like Dazzling Diamonds at all! It’s VERY easy to clean up and so far I haven’t heard any complaints from Mr. Maui Stamper, also known as He Who Does NOT Like Glitter, Not One Little Bit. The Glass Glitter stays put with Tombo. This was fun, but I’ll repeat what I heard from others – don’t rush the Design-a-House. I took my time tracing the templates onto my Designer Series papers and adhering them to the walls, and I used a LOT of Tombo because I didn’t want any air bubbles. I used the flat applicator side on the Tombo bottle and covered the wall before I put the paper on, and I was pleased with the results. I did go a little over-the-top with the windows, because instead of cutting them out, I cut an “X” through the DSP and folded it back in around the opening to create a finished edge. 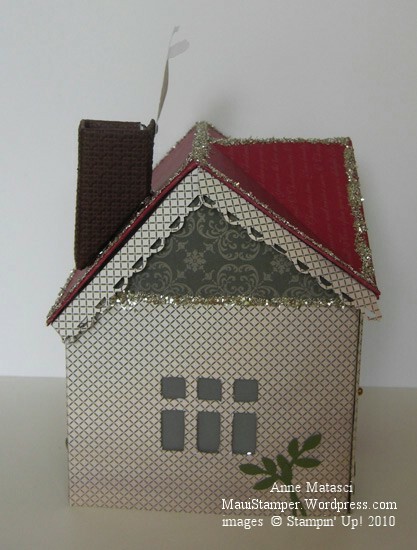 The chimney is Chocolate Chip cardstock that went through the Big Shot with the Lattice embossing folder. The scallop trim under the eaves was cut as one long strip, but it wouldn’t sit flat when I attached it underneath the roof, so I trimmed and mitred the peaks. The wreath on the front door is a circle – I think the 1 inch – with another circle – I think it was 1/2 inch – punched out of the center. I layered the Tombo on and covered it with Glass Glitter and just let it dry. Wouldn’t it be fun to have a collection of these over the years to showcase Stampin’ Up! Christmas papers? I LOVE this house! The paper and glass glitter are perfect and Santa tops is off just right! It’s gorgeous! LOVE the scallop trims along the roofline! Now this would take the pressure off Nana Jane’s seldom successful gingerbread house creation with the grandkids 😉 Pull this out of the box and do cards with them instead! 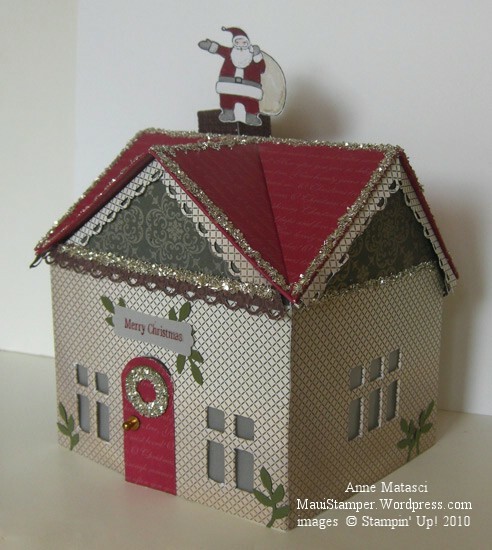 Anne, I’ve always been a fan of those Christmas villages & just love your house! The possibilities are endless! I’d like to make one that looks like my house. Is there a template? Can you send us one? We don’t have any Christmas decorations and you can’t get real Christmas trees in Australia, only fake ones. I don’t know, Carol – what does Clarry think about glitter?